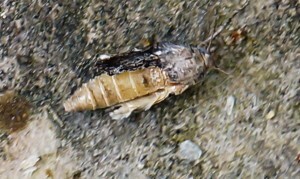 When making splits yesterday I saw what looked like a bigger Wax moth with crippled wings. I moved like one too, trying to run away without flying. And this one couldn’t fly at all. Is it a bigger wax moth? Can wax moth be affected by Deformed Wing Virus? And can it spread the virus to other bees? I guess though not as effective as other bees when they drift into neighboring hives, or rob them. Yes, do struggle for resistant bees. Don’t just talk about it! Or say an easy no, it’s impossible, or an easy yes: ”Just do like I tell you.” Tell me your success story. I tell you mine, well a part of it here. 1989 I went to Kenya and got breeding material from Apis mellifera monticola, the mountain bee. Yes, that was a good longshot. I don’t regret it. In 2000 I visted Lusby’s in Arizona and got hooked on smaller more natural cellsize. 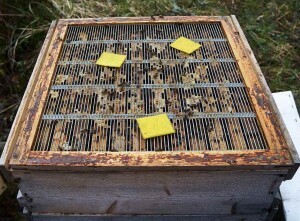 I don’t regret that either, even if I’m not sure how much it helps against varroa mites. It’s more natural and bees don’t perform worse with it, in any way. Natural selection benefits survival and it has selected for small cell size in brood area at least. There are obvious benefits like rapid spring build up. 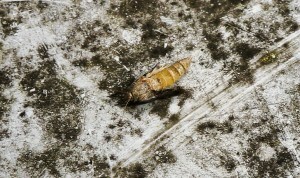 I thought I had regressed my bees down to 4.9 mm cell size when varroa hit hard in 2008. The mites arrived a couple of years before to my area. But it turned out when I analyzed the dead colonies following that many had too many badly drawn combs. Quite some combs looked like this, but they are gone now. I didn’t want to use acids as my conclusion was, wrong or correct, that formic is to hard at the bees and dangerous for me. Oxalic put me also in danger as I can’t smell oxalic fumes, but formic it’s no problem smelling. Inner organs and skin you know. I want to keep them going. Nerve poisons like Fluvalinate and organic phosphates like Coumaphos, cancerogenic like Amitraz and it’s breakdowns. My gut said no. The only thing left was Thymol. Yes it kills a lot of microbes as well. But it’s a spice and you find somewhat in basswood honey. My conclusion was that it’s better with some living colonies than all dead. You can select the best among the living. It’s no use among the dead. Was it possible to use less and less Thymol? 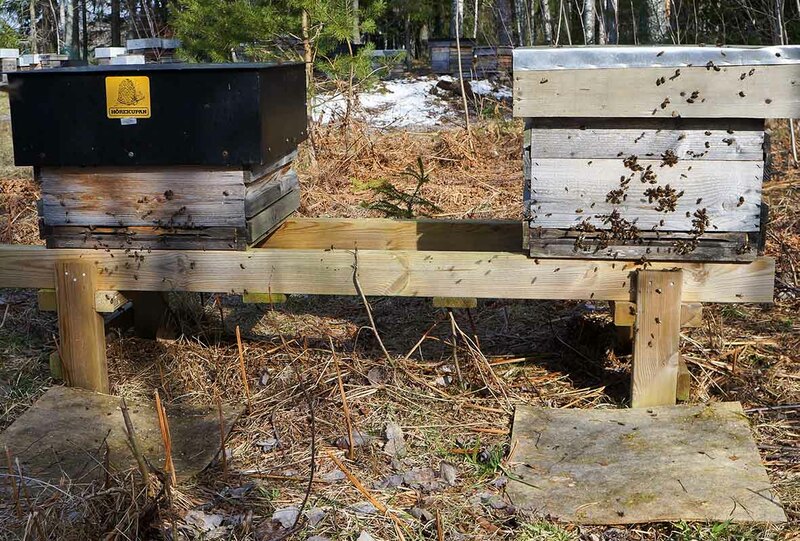 The bees were so overhelmed with DWV (Deformed Wing Virus) and mites that no one would have been left of my 250 colonies in 2008. Well, maybe 10 % when autumn 2009 came,…. When spring came 2009 I had lost 50 %. I got a feeling the mites were filled with viruses when coming to the area. I lost several tens of thousands of dollars in left out income in struggle for more resistant bees. But I didn’t want to get caught in the chemical trap. Thymol for susceptible bees you need minimum two trays with 25 g thymol each (50 g in total). 10-14 days apart. If only treatment normally too little in a year. 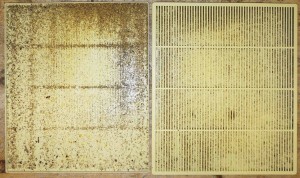 For some years now 80 % of my bee colonies have been treated. I have used in average10-15 g of thymol a year on my colonies (all included then). A few needed 35-40 g. They have of coursed got new queens. One piece of Thymol with 4-5 grams on a struggling colony in spring. I now winter about 170 colonies. I have lost 15 % of the colonies the last winters. (But this winter seems to end much better.) 30 % of those that survive have been small, got treated and new queens and gave no honey. The average honeycrop, including the 15 and 30 % mentioned has been about 50 pounds (25 kg). The top colony almost every year reach 400 pounds. 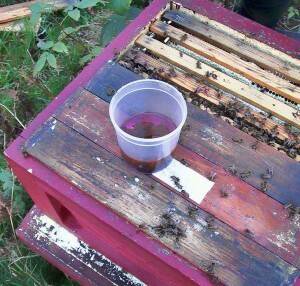 The apiaries differ a lot in yielding nectar. 15 g of Thymol on a strong colony in summer, with supers above the excluder. Few cases. I treat only (and I do it mostly right away regardless when it is in the season) when I see a couple of deformed winged bees outside or inside the hive. 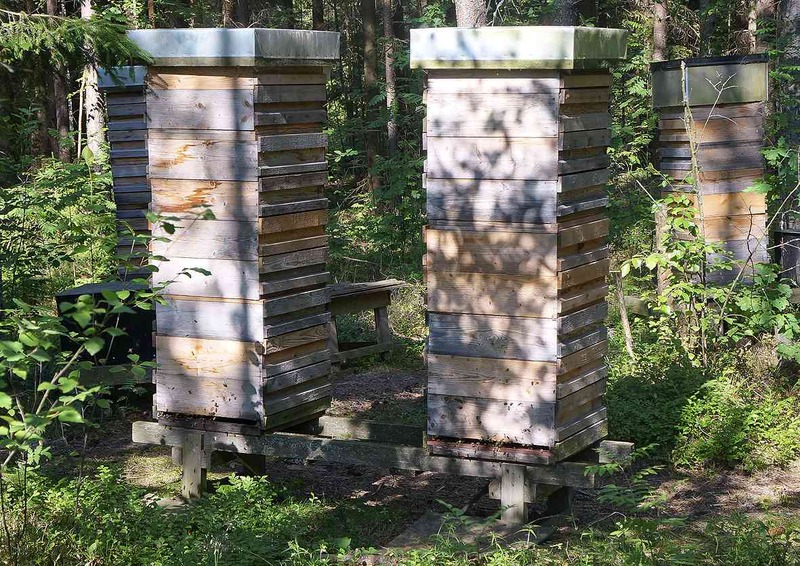 The hives are equipped with a board half a meter in square in front of the entrance for easier seeing what the bees are dragging out of the hive. 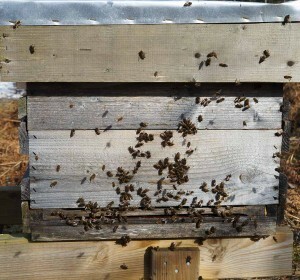 Mostly the colonies are being treated in spring or in late summer. Those few treated with honey supers on get the honey ventilated in zig-zag stacks of supers in a warm room with a fan going for at least a week before extracting. To vent out thymol smell. There’s only my stock of bees in quite a big central area where I have my bees. 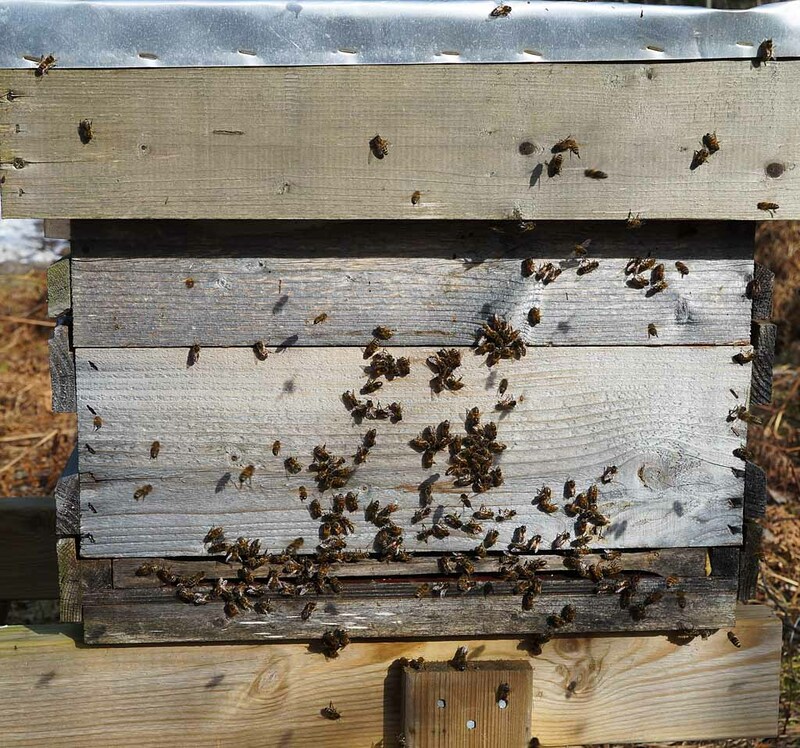 In the outer areas my bees dominate. 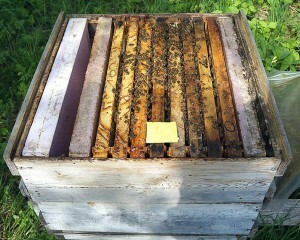 I keep about 10 colonies in each apiary and they are as close as I can find places for them. 1 mile (1.5 km) between them would be ideal. The queens are mated in the apiaries. 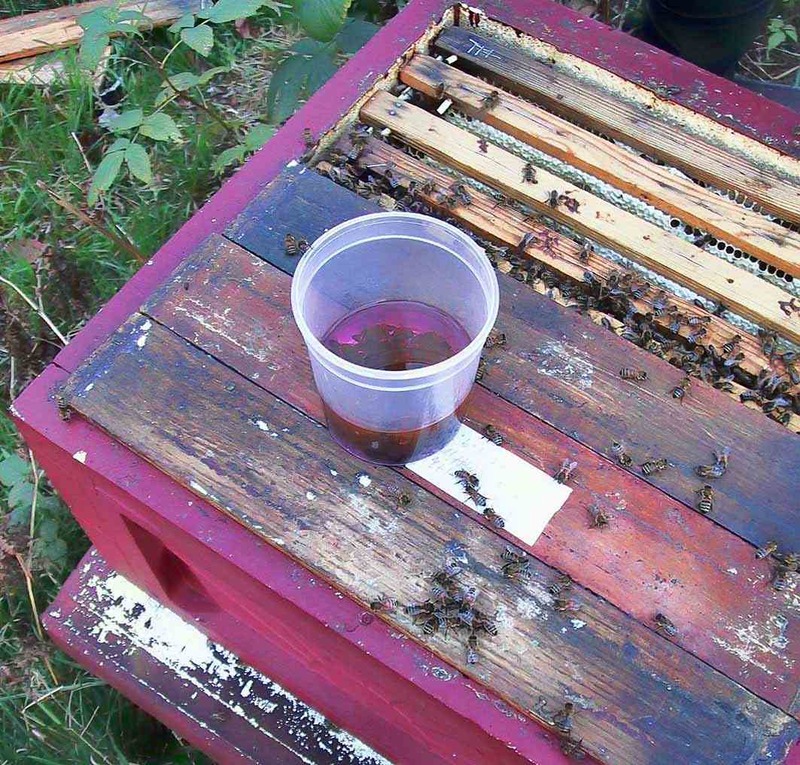 Last year (2013) I used thymol on 50 % of my bees. In average I used 5 g thymol, all colonies included. For breeders I use colonies that havn’t been treated for at least the two previous years. The number of breeder candidates has increased for every year. Last year I started to check the VSH trait. I think this will make it possible to check eventual breeders a year earlier then before. The VSH tests I did last year on my 5 breeders gave the following results: 1) 50 %, 2) 40 %, 3) not possible as I didn’t find one single mite in the brood, 4) not possible as the four year old queen died of age early (I just was able to make one graft), 5) not possible as the three year old queen produced more than 50 % drone brood. 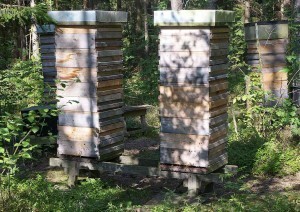 A good apiary. Bee escapes on. Next visit the bee blower rids the boxes from the remaining bees. It will be when yo take 4 boxes like from the colony to the right. (That’s at least 150 pounds of honey). I know it can be beneficial to count mites. But I don’t have the time. But those colonies I check for VSH, they will get figures enough to get the infection rate for mites in brood. (But I just check some.) Sometimes I’ve heard that two thirds of the mites are in the brood. If that’s correct then the infection rate on bees (phoretic mites) is half of that. Many use the infection rate increase from one time till some time later to get a figure of resistance, saying the colony with lowest increase is more resistant. That might be true, but infection rate is dependent on other factors then mite reproduction success in the colony, such as reinvasion of different causes. So I use the lazy method checking for signs of virus (DWV), thus also selecting for virus resistance. Then when I see this, I treat, with thymol, just the colony (-ies) showing virus. Over the years the number is decreasing and the amount of thymol is decreasing also, telling me this is a method that works. For alcohol wash I recommend taking bees in the broodnest third frame from the back or one side to avoid including the queen in the alcohol and getting away from the entrance. If you count mites, the most accurate method I think is alcohol wash, of as many bees you can afford (100-300 bees) when the colony has no brood (or as little brood as possible). Shake the bottle with bees and alcohol strongly for a minute to loosen the mites. Pour them on a double sieve. Flush water on the bees strongly and count the mites in the second sieve. 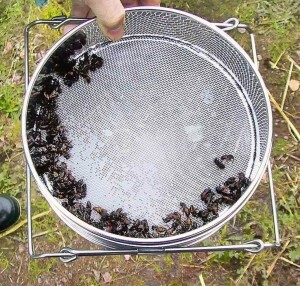 Also count the bees in the first sieve. But beware where you take the sample. Don’t take it on bees close to the entrance. Mites are fewer there according to findings of Thomas Kober (personal information). So how do you avoid entrance bees if you have all the combs sitting with their edges towards the entrance? The best place maybe is in the broodnest but as far away from the entrance as possible, box two or even three maybe. I havn’t seen a paper on where the best place is. Maybe you have? This is another reason I don’t count mites, the uncertanity if the density of mites is the same in different places in the hive.